The nature of my work is such that I MUST throw parties whenever I can.. and I find any excuse to do so! Holiday parties are a staple in today's society; whether it's the annual office party, a family event, or a chic affair you managed to snag a not-very-cheap ticket to, the holidays are a time for bringing people together and celebrating. 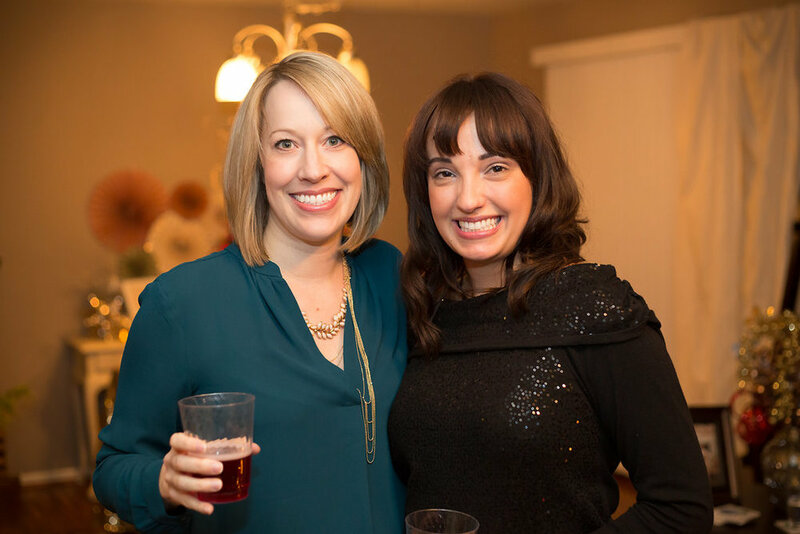 I love throwing an annual holiday party, and I tend to mix it up, because you want to keep people on their toes! Last year I decided to throw an intimate party at my home for my closest girl friends. The theme was Merry & Bright and Oh So Sparkly! It's best to come up with some sort of theme when organizing a party so that you make sure to keep all elements of the party coherent. No one wants their party to look like Christmas exploded inside their house. I have narrowed down some pointers to help you plan the party of the year! If you are throwing your party in your home, you are not going to use the entire house to entering your guests. Chances are, the party will be contained to a few rooms... the kitchen, dining room, and living room, for example. In order to create a welcoming, centered space, you want to have a focal vignette that sets the tone for the party and creates a grounding "center" for the guests. This could be a display on the dining room table complete with favors, a candy bar, and desserts. 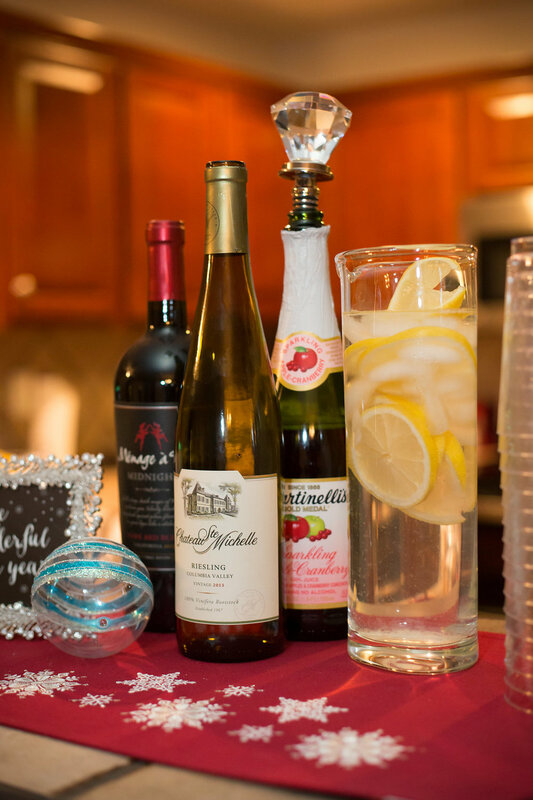 You could also re-purpose your wine bar to make it a "bubbly bar" or dessert station. 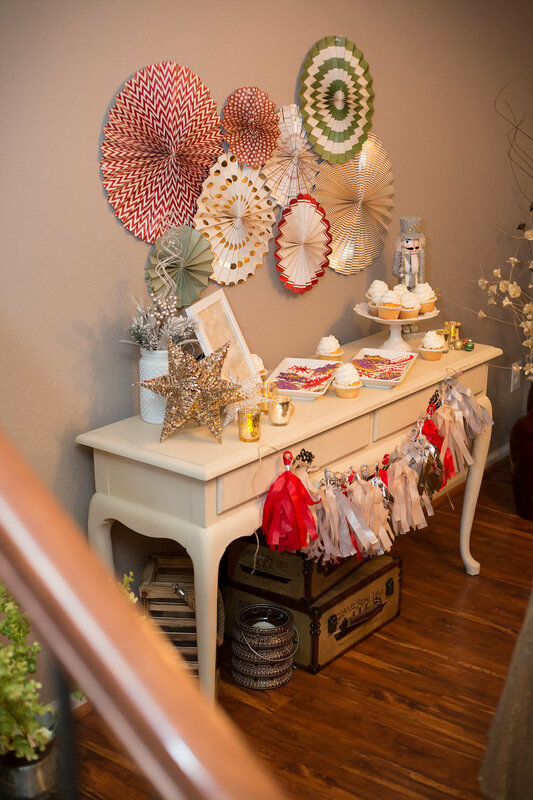 At my Merry and Bright party, I transformed the sideboard in my dining room into a dessert station, and created a holiday vignette on the dining room table. I had custom made holiday cookies (sparkly!!) 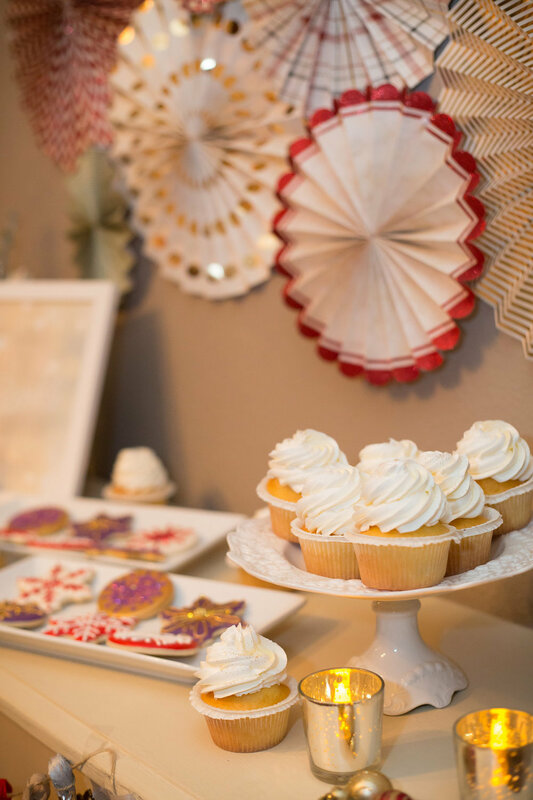 and cupcakes from two of my favorite designers, and displayed them alongside festive decor. It is a great idea to add wall decor in your focal space make the design more dynamic. I found adorable (and sparkly) pinwheels on Etsy which I hung over the sideboard in place of the big painting I usually have displayed. My amazing friend and florist crafted a massive centerpiece to pull the room together and draw the guests' eyes. This was the focal piece for my table. Around it, I created a fanciful holiday scene with glittering trees and a dramatic masquerade mask that totally fit my decor. I also love having signs with fun little quotes at my parties... and don't forget that gold sequin linen!! You'll need to decide what type of party you are having... a cocktail party, a dinner, brunch, or desserts and bubbles! I decided on appetizers, cocktails and desserts for my party. My go-to is always a charcuterie display because they are so chic and everyone loves them. One of my girls loves making them, so I enlisted her to bring that item. I always have wine and champagne because it's my favorite, and we topped the night off with those delectible cupcakes and cookies! The last and most important part of any party is to invite all your favorites and enjoy the time you spend together!